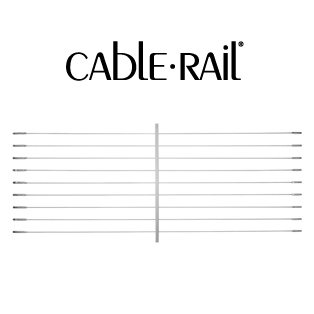 CableRail Deck and Stair Railing Kits by Feeney are sold in a wide range of standardized pre-cut lengths for easy ordering. There is no wasted time taking precise railing measurements; just select assemblies that are longer than you need and trim any excess in the field. Each assembly includes special Threaded Terminal and automatic-locking Quick-Connect® SS attachment fittings that are sleek, simple to use, and easy to conceal. The result is not only extremely durable and aesthetic but virtually invisible, allowing beautiful, unimpaired views. Offered in lengths of 5 to 70 feet in increments of 5 feet. Need help with your selection? Take a look at our comprehensive guide to buying a cable railing kit or our list of FAQs here.